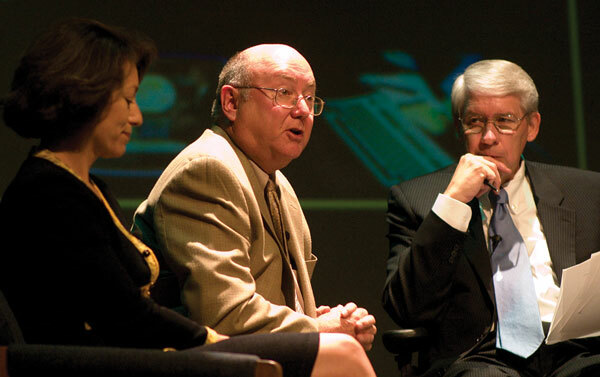 The “future of news” was on the minds of (from left) Susan Goldberg and Jim Houck on Friday. The two newspaper editors were part of a panel of four journalists who discussed how new technology has cut into newspapers’ market. Under the moderation of Fresno State professor Jim Tucker the group discussed where journalism is headed. If you habitually read the paper, then you are one of a dying breed, a speaker said Friday at Fresno State. “The business models of the newspaper are right now under siege, and I don’t think there’s any way to get around that,” said Susan Goldberg, executive editor of the San Jose Mercury News. The future of the news was alternatively painted bleakly and optimistically. Panelists in the opening segment adopted a more critical stance, citing falling readership, the lack of diversity in the newsroom and competition from blogs and online services as contributing to the print media’s decline. Pruitt seemed to embrace the changing landscape and stressed the importance of adapting to the times. Unlike most publications, the McClatchy Company has experienced increased circulation over the past decade. “How can we be widely successful, but dying? What is the answer to that paradox?” Pruitt asked. Pruitt cited diversification and focusing on immediate, not nationwide, outlets as key. Earlier the four panelists addressed the increasing rivalry newspapers face with the online media, and how they have to adapt to remain viable. Online media can condense content and cater to a more specialized audience. Other panelists included Jim Houck, editor of the Visalia Times-Delta and journalist Jeff Rowe. All the panelists agreed a decline in readership persists, particularly among the younger generation. The panel members seemed to agree that diversifying the gender, ethnicity and ideology of the newsroom would also promote credibility and objectivity. “Reporters should be neutral observers. If we’re not, I wonder how credible we would be,” Rowe said. In a departure from last year’s symposium, most of the panel acknowledged that many journalists are liberal. Last year’s keynote speaker, Helen Thomas, flatly dismissed such a notion. “I honestly wish we had more conservative, anti-abortion gun owners in our newsroom… not that they’d take the gun to work,” said Goldberg of her desire for a more diverse mix of reporters. Porter agreed over-representing one ideology, ethnicity, or educational background could create a disconnect with the public. He said he didn’t think personal ideology necessarily reflects in current reporting. The panel also touched on the use of anonymous sources and embracing change in the news format. They agreed newspapers should not all look the same in terms of national news content, but should reflect the regions they serve. About 200 students attended the event, said journalism professor Tommy Miller, symposium coordinator and Roger Tatarian chair. The presentations did raise concern among some journalism students planning on entering the field. “I wonder about the direction journalism is taking us,” said Brandon Santiago, a broadcast journalism major. Katie Hicks, a print journalism senior, enjoyed the symposium and said Pruitt was more upbeat than she expected.